Congratulations to South Carolina AHEC Executive Director Dr. David Garr on his recent recognitions for his contributions to advancing healthcare and health professions education. Dr. Garr was recognized earlier this year by the American Association of Colleges of Nursing as the recipient of the Geraldine “Polly” Bednash Lectureship Award. According the AACN: Award recipients are chosen by the AACN Board of Directors on the basis of their scholarship and the notability of their contributions to nursing, health care, higher education, and/or interprofessional education. Learn more about the award on the AACN website. Dr. Garr was recognized at the South Carolina Academy of Family Physicians Summer Break Away and Annual Assembly as the recipient of the 2018 SCAFP Distinguished Service Award. 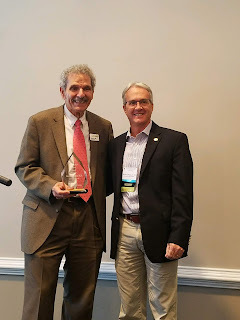 Dr. Garr was also awarded the Red Koelling Distinguished Service Award from the National AHEC Organization at its biennial conference in July for his dedication to AHEC’s mission and work as a champion for AHECs nationally. This award is named after Henry "Red" Koelling, the founding South Carolina AHEC Director of Finance, who also was one of the authors of the original AHEC application to HRSA in 1972.